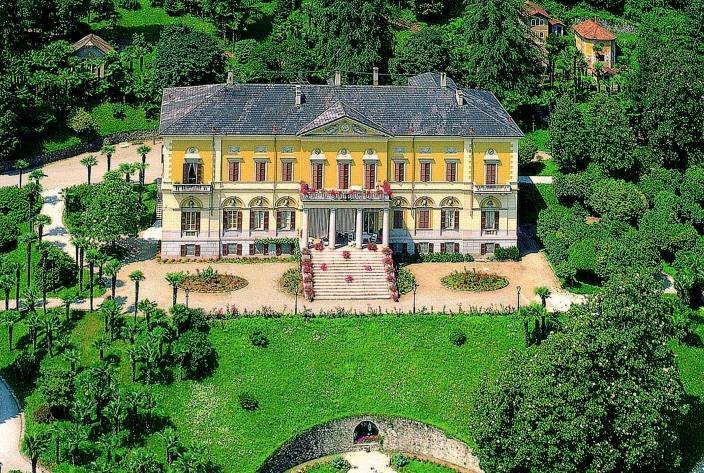 Villa Faraggiana is an elegant neoclassical structure located in a panoramic position on the Piedmont shore of Lake Maggiore between Arona and Meina, along road Nazionale del Sempione. This elegant building can be identified by the two marble lions crouched on the top of the supporting pillars of the gate. This is one of the most majestic and important buildings on the Piedmont shore of Lake Maggiore. 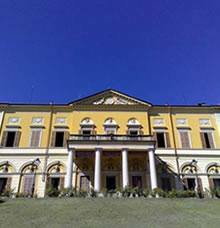 Villa Faraggiana was built in 1855 on a project by known engineer Antonio Busser from Galliate, who was commissioned by the noble Faraggiana family from Sarzana, who moved to Novara sometime in the middle of the 19th century. The villa was used as a holiday house by senator of the Kingdom of Italy Raffaello Faraggiana (1841-1911), who often stayed here with his wife Caterina and sons Alessandro and Guido. It was precisely the mother (cousin of well-known explorer Ugo Ferrandi) who transmitted her passion for studying animals and natural science, to her son. 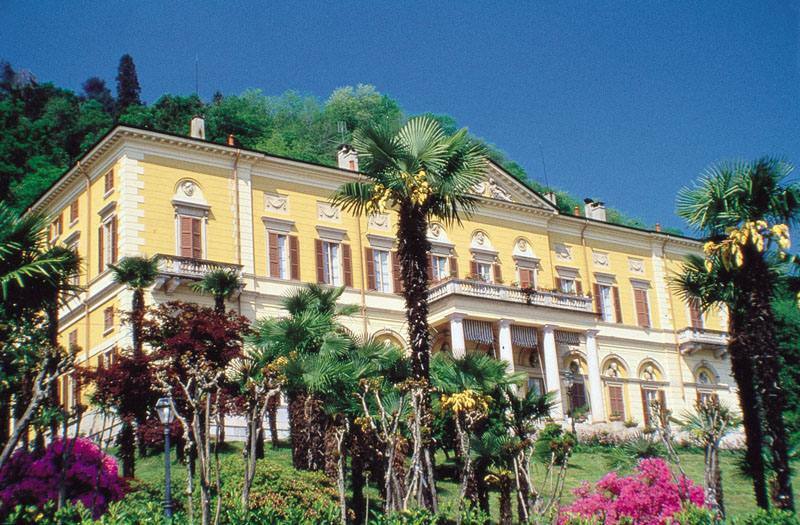 The large park at Villa Faraggiana was home to a zoological museum and a large collection of animals – both alive and stuffed – which was the fruit of Alessandro’s trips to Africa. Today the collection is an integral part of the Museum di Storia Naturale Faraggiana Ferrandi (Faraggiana Ferrandi Museum of Natural History) in Novara. The original owners having died and not used by its heirs, during the war the villa became a place of refuge for evacuees, soldiers and surviving Jewish. In 1949, the descendants of the Faraggiana family donated the complex to the Nuns of the Order of the Poverelle from Bergamo, who first used is as an orphanage and later as a place for convalescing. 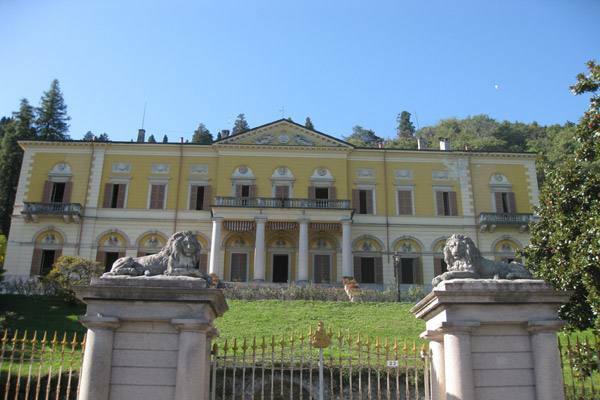 Villa Faraggiana has a rectangular layout and is a clear example of neoclassicism especially near the middle and end sections, which separate the marvellous façade overlooking the lake. Conceived as a holiday residence, it has a very wide façade (44 metres) full of detail, such as the tympanum, the high-reliefs, medallions depicting great individuals from Italian literature and the busts of illustrious personalities. A monumental flight of steps precedes a portico supported by four columns, which is covered by a terrace. The view here of Lake Maggiore is marvellous. The villa is surrounded by a large park (some 70 hectares) once home to precious plants and marvellous orchids and, as already mentioned, inhabited by exotic live and stuffed animals. Rumours over the last few years indicated that George Clooney would possibly buy Villa Faraggiana, however these were denied by its extraordinary opening to the public on occasion of the Giornata FAI di Primavera 2011 day dedicated to spring.